Vundablog.com: GO GO! 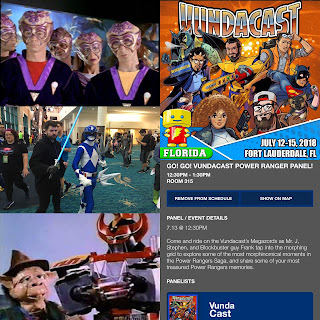 VUNDACAST Power Rangers Panel with the Lavender Ranger! GO GO! VUNDACAST Power Rangers Panel with the Lavender Ranger! This was the 4th of our ten panels @FLORIDASUPERCON.Your humble hosts had a great time and shared a lot of cool stories and jokes. We would love to get emails and tweets from all the interesting characters we interacted with and make sure to let#supercon know you enjoyed us and want us back. Go Go Support Lavender Rangers Patreon for awesome art and fun comics!!! on August 4th at the Miami Airport Convention Center. We will be running a raffle with proceeds to go to Pridelines.